Owned by Singapore-based technology giant BIGO Technology Pte. Ltd., LIKE App – a popular short video platform introduces its brand-new photo-editing feature Superme to offer youngsters better video creation experience. With users increasingly demanding a premium photo and video visual experience, dynamic photo content creation combined with video conversion has become the next big thing for all social apps. LIKE, an innovation-driven app, has launched Superme with cutting-edge game engine technology to realize real-time interactive image application processing which offers an innovative option to combine photo-editing with video creation. With this feature, users can easily transfer a 2D image to a 3D video – photo processing can now be done with a single click. Superme adds a premium in-app experience that no other app in India provides. To meet the diverse requirements of a vast user base, Superme includes four series (Love, Creative, Cool and Funny) of over 80 exquisite and interesting effect options. 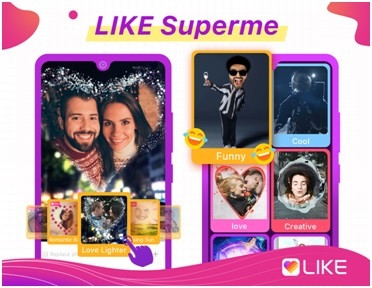 Along with the launch of a new feature, LIKE App also brings forth the #LIKESuperme challenge to encourage people to have fun with their friends and family by expressing themselves with this marvelous feature. Within 24 hours of the challenge being launched online, over 80,000 users created videos, with a total of over 50 million views, sparking a new video trend in India. LIKE is a popular short video platform that allows video creation and editing with music and special effects. It is a creation of BIGO Technology Pte. Ltd., a mobile internet company that develops video editing, video broadcast, and VoIP-related products and is headquartered in Singapore.